If you have ever seen Ghost (the 1990 movie starring Patrick Swayze and Demi Moore) then you will be aware of how the potter’s wheel can be manipulated on film to become something quite, well, suggestive. Not to anthropomorphize ceramics, of course, but one can only wonder how the poor vase felt. This short featuring Eric Landon of Tortus in Copenhagen goes some way to address that grave injustice. 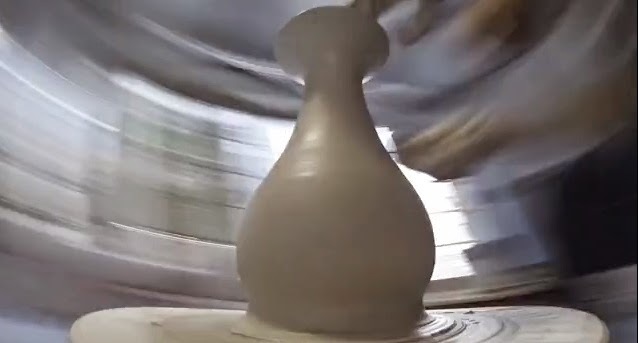 It follows the process of ceramic making from the perspective of the vase rather than the person, the creation rather than the creator (which sounds like something of a lesson for life). Patrick and Demi may have been cute (and Eric is rather dashing too) but the real beauty can be found in the process of creation, dizzying though it may be at times. I would almost guarantee that you won’t be able to stop watching this until the process is complete. And then you might have to hold on to something for a while.